To Cite: Choudhury J, Rath D. Thrombocytosis in Under-Five Children with Lower Respiratory Tract Infection, Arch Pediatr Infect Dis. 2018 ; 6(1):e61605. doi: 10.5812/pedinfect.61605. Background and Objectives: Thrombocytosis is a marker of inflammatory reaction with various clinical outcomes. The current study aimed at evaluating the incidence and significance of degree of thrombocytosis in relation to severity of the pneumonia in children less than 5 years old with lower respiratory tract infection. Methods: The current prospective observational study was conducted over a period of 12 months on 230 children aged 2 to 60 months, hospitalized for lower respiratory tract infection. Patients were classified into 2 groups of patients with or without thrombocytosis. Demographic profile, clinical severity, radiological findings, complications and outcomes of the 2 groups were analyzed and compared. Results: Out of 230 children, 122 (53.04%) had thrombocytosis and 108 (46.96%) not had thrombocytosis. Among children with thrombocytosis, 12 (9.83%) had pneumonia, 48 (39.34%) had severe pneumonia, and 62 (50.8%) had very severe pneumonia. Out of 108 children without thrombocytosis, 58 (53.7%) had pneumonia, 16 (14.8%) had severe pneumonia, and 34 (31.4%) had very severe pneumonia. Thrombocytosis was found in 82% of pneumonia cases with pleural effusion. Prolonged hospitalization was significantly associated with thrombocytosis. Leukocytosis had also significant association with pneumonia severity. Conclusions: The current study indicated that children with lower respiratory tract infection frequently had associated thrombocytosis. The duration of hospital stay and severity of pneumonia were clearly higher in the group with high thrombocyte count. Thrombocyte count can be used as a predictor for the severity of the disease in children less than 5 year old with pneumonia to prioritize them. Primary or essential thrombocythemia is extremely rare in the pediatric age group, but infections at any part of the body including meninges are the common causes of reactive thrombocythemia in children. Besides acute infections, chronic inflammation and chronic hemolytic states are the other causes of pediatric thrombocytosis (1). Reactive thrombocytosis of 6% to 15% was reported among hospitalized children (2). Fauzas et al., studied reactive thrombocytosis in febrile young infants with serious bacterial infection and suggested that thrombocyte count can be a predictor for the severity of infection (3). Ozcan described upper respiratory tract infection as the most common cause of reactive thrombocytosis followed by pneumonia (4). Subramaniam et al., indicated that respiratory infection was the predominant (28.3%) infectious cause of reactive thrombocytosis (5). Hadidopulou found reactive thrombocytosis in children with viral respiratory tract infection (6). However, Wolach et al., found thrombocytosis in children with pneumonia and empyema (7). Similarly, Atef et al., evaluated platelet count in hospitalized patients with the community-acquired pneumonia and found that platelet count may be more informative to predict poor outcome than abnormal leukocyte count (8). With the wide spread availability of automated analyzer in the field of hematology, platelet count is often taken as a component of routine hematology work-up of every patient. As total platelet count is a part of complete blood count, thrombocytosis is frequently encountered in day to day practice. Elevated level of thrombopoietin (TPO), interleukin (IL)-6, IL-3, IL-11, and catecholamines play major roles in reactive thrombocytosis due to infection. Platelets play a vital role in antimicrobial host defense mechanism, by inducing inflammation and tissue repair. Activated platelets bind aggregate and internalize microorganisms, which hasten the clearance of pathogenic organism from the blood stream. They also take part in antibody-dependent cell cytotoxicity to kill pathogens. Severe community-acquired pneumonia is associated with increased plasma level of inflammatory mediators such as tumor necrosis factor (TNF)-alfa, IL-1B, IL-6, and IL-8. Also, the level of TNF-alfa, IL-1B, and IL-6 increased in the broncoalveolar lavage fluid of the same patients (9). Normal thrombocyte count varies from 150000 to 450000/mm3; platelet count more than 500 000/mm3 is observed in 3% to 13% of pediatric population (10). Respiratory tract infections constitute 60% to 80% of reactive thrombocytosis among the systemic infections, which can lead to complications such as pneumonia. As pneumonia gose to be the leading cause of mortality in children less than 5 years in the developing countries such as India, the current study primarily aimed at finding out the association between severity of pneumonia and degree of thrombocytosis, and secondary aimed at evaluating whether a simple test such as platelet count can be used to predict complications and outcomes of pneumonia in the targeted age group to prioritize them in a poor resource setting, similar to the current study. The current prospective observational study was conducted in the department of pediatrics over a period of 1 year from November 2015 to November 2016. All patients within the age range of 2 to 60 months admitted with a clinical diagnosis of lower respiratory tract infection were studied. Patients were classified as per world health organization (WHO) criteria in acute respiratory infection (ARI) control programme guidelines (11). Children with lower respiratory tract infection, associated with connective tissue disorders, congenital heart diseases, and anemia (hemoglobin (Hb) < 10 mg/dL) were excluded from the study. After signing the written consent by the parents, the demographic profile, clinical data, and laboratory testing results of each participant were collected. Complete blood count (CBC) was performed with automated Sysmex, a 6 part analyzer (XN Series), and differential count was performed by a hematologist for any abnormality. Chest radiographs were assessed by the radiologist. As per ARI control programme, tachypnea was defined as respiratory rate more than 50/minute in children aged 2 to 12 months and more than 40/minute in children aged 12 to 60 months. Presence of tachypnea, retraction of chest, or SpO2 < 94% in room air was considered as respiratory distress. Clinical severity of the disease was classified as pneumonia, severe pneumonia, or very severe pneumonia. The duration of hospitalization and radiological findings were noted. Thrombocytosis was considered when peripheral blood platelet count was > 500 000/mm3. Thrombocytosis is further divided as mild if platelet count ranges 500000 to 700000/mm3, moderate if ranges 700000 to 900000/mm3, and severe if ranges 900000 to 1000000/mm3. Extreme thrombocytosis was defined as platelet count > 1000000/mm3. All the patients were classified into 2 groups on the basis of platelet count; ie, patients with or without thrombocytosis. All the variables were compared and analyzed with SPSS version 16. Results of data analysis were expressed as numbers and percentage. Comparisons of the frequency of variables were made using chi-square test. P value ≤ 0.05 was considered as statistically significant. A total of 230 children, admitted with lower respiratory tract infection in the under study hospital, were included in the study out of which 170 (73.9%) were within the age range of 2 to 12 months and 60 (26.1%) within the age range of 12 to 60 months. 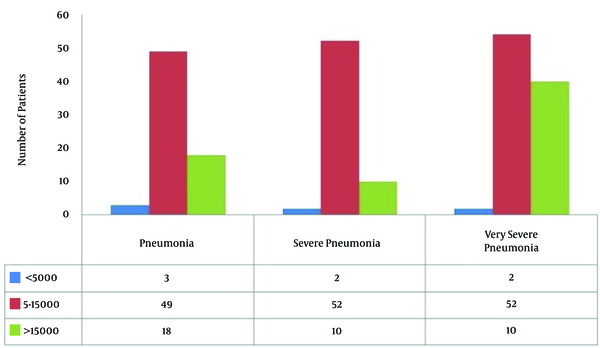 A total of 96 (45.7%) children were admitted with very severe pneumonia, 64 (27.82%) with severe pneumonia, and 70 (30.4%) with pneumonia (Figure 1). Out of 170 infants, 80 had very severe pneumonia, 52 had severe pneumonia, and 38 developed pneumonia. Out of 60 children in the age group of 12 to 60 months, 32 had pneumonia, 16 had severe pneumonia, and 12 had very severe pneumonia. This clearly depicted that the severity of pneumonia was more marked in infants than older children. Thrombocytosis was found in 122 (53%) of all the study population with pneumonia out of which 76 (62.29%) were infants. There was a significant association between platelet count and severity of pneumonia (P < 0.05). Five children had severe thrombocytosis out of which 4 had very severe pneumonia and 1 had pneumonia. All the 4 children with very severe thrombocytosis also had very severe pneumonia. This indicated an association between the severity of pneumonia and degree of thrombocytosis (Table 1) (Figures 2 and 3). Association between leukocytosis and severity of pneumonia was statistically significant (P = 0.0086). Out of 96 cases with very severe pneumonia, the total leukocyte count was 5000 to 15000/mm3 in 54 (56.2%) cases, > 15000/mm3 in 40 (41.6%) cases, and < 5000/mm3 in 7 (2.08%) cases (Table 2 and Figure 4). 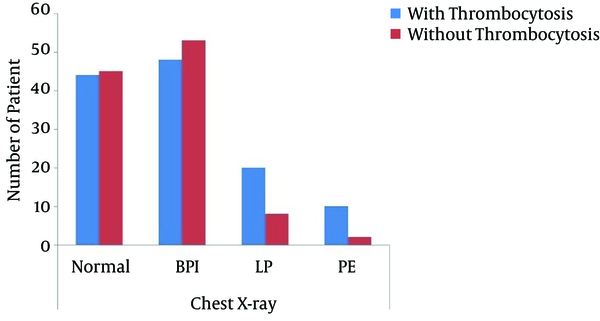 The association between thrombocytosis and chest X-ray findings was statistically significant (Figure 5). Out of 12 children with pleural effusion, 10 (83.3%) had thrombocytosis (P = 0.009). Out of 28 children with lobar pneumonia, 20 (70.14%) had thrombocytosis. Most of the children with bronchopulmonary infiltration in chest X-ray had platelet count within normal range. There was a significant association between the thrombocytosis and duration of hospitalization (P = 0.0008) suggesting higher morbidity in the group with thrombocytosis (Table 3). Though platelets play a vital role in antimicrobial host defense, the exact mechanism of reactive thrombocytosis is unknown yet. During respiratory tract infection, the level of inflammatory cytokines increases, which heighten the production of thrombocyte. Lower respiratory tract infections are the leading cause of mortality in children less than 5 years old. Mortality rate and the severity of disease are usually high in young infants and young children. In the current study, out of 230 subjects, 170 (73.9%) were less than 12 months. Severity of illness was more in infancy, which was supported by other studies (12, 13). Platelet count increases with increasing the severity of pneumonia. In the current study, 13.9% of the children had thrombocytopenia, 33.0% had normal thrombocyte count, and 53% had thrombocytosis. Out of 122 children with thrombocytosis, 72.13% had mild thrombocytosis, and moderate thrombocytosis was found in 20.4% of the subjects. Severe and very severe thrombocytosis were found in 4.09% and 3.2% of the children, respectively. Other studies showed findings similar to those of the current study (14, 15). They showed that 48% of the admitted children with lower respiratory tract infection had thrombocyte count > 500000/mm3. The critically ill children had more severe thrombocytosis. Unsal et al., concluded that the symptoms were more severe in patients with thrombocytosis, compared with the ones with normal thrombocyte count (16). In the current study, out of 230 cases, 5.38% had total leukocyte count < 5000/mm3; however, it was 5000 to 15000/mm3 in 67.39% of the subjects and > 15000/mm3 in 29.56% of them. The results were in agreement with a study by Purcell et al. (17). All 6 children with severe and very severe thrombocytosis also had leukocytosis (> 15000/mm3), which suggested a significant association between leukocytosis and thrombocytosis (P < 0.001). A study by Mirsaeidi et al., found significant association between thrombocytosis and the 30-day mortality, but no association between leukocytosis and the 30-day mortality in children. They suggested that thrombocytosis was a better prognostic indicator than leukocytosis. They also found a significant association between high thrombocyte count and pleural effusion (18). In the current study, the duration of hospital stay showed a significant association with thrombocytosis (P = 0.008), which was similar to the results of the study by Srineevasa et al. (19). They opined an association between thrombocytosis and very severe pneumonia as well as prolonged hospitalization, which was similar to the results of the current study (19). The current study found that the majority of the cases with radiological evidence of pneumonia or pleural effusion also developed thrombocytosis, which was similar to the results of the study by Prina et al. (20). They concluded an association between thrombocytosis in patients with the community-acquired pneumonia and pleural effusion, empyema, and poor outcome (20). In agreement with other studies, the current study concluded that thrombocytosis was a useful indicator for the severity of the disease and complications in children with lower respiratory tract infection. Small sample size was a limitation of the current study, and the results should be validated in a larger cohort. Increased thrombocyte count was commonly associated with pneumonia in children. Children with thrombocytosis usually develop severe illness and complications resulting in prolonged hospital stay. Degree of thrombocytosis is directly correlated with severity of illness. Thrombocyte count may be considered as a simple and useful tool to assess priority in patients in the developing countries such as India. Authors’ Contribution: Jasashree Choudhury: study design, abstracting and analysing data, writing the manuscript; Debasmita Rath: statistical analysis and interpretation of data. 1. Marwaha N. Thrombocytosis as a predictor of serious bacterial infection. Indian Pediatr. 2010;47(11):923-4. [PubMed: 21149900]. 2. Dame C, Sutor AH. Primary and secondary thrombocytosis in childhood. Br J Haematol. 2005;129(2):165-77. doi: 10.1111/j.1365-2141.2004.05329.x. [PubMed: 15813844]. 3. Fouzas S, Mantagou L, Skylogianni E, Varvarigou A. Reactive thrombocytosis in febrile young infants with serious bacterial infection. Indian Pediatr. 2010;47(11):937-43. [PubMed: 20453268]. 4. Ozcan C, Sayli TR, Kosan-Culha V. Reactive thrombocytosis in children. Turk J Pediatr. 2013;55(4):411-6. [PubMed: 24292035]. 5. Subramaniam N, Mundkur S, Kini P, Bhaskaranand N, Aroor S. Clinicohematological study of thrombocytosis in children. ISRN Hematol. 2014;2014:389257. doi: 10.1155/2014/389257. [PubMed: 25006474]. 6. Haidopoulou K, Goutaki M, Lemonaki M, Kavga M, Papa A. Reactive thrombocytosis in children with viral respiratory tract infections. Minerva Pediatr. 2011;63(4):257-62. [PubMed: 21909061]. 7. Wolach B, Morag H, Drucker M, Sadan N. Thrombocytosis after pneumonia with empyema and other bacterial infections in children. Pediatr Infect Dis J. 1990;9(10):718-21. [PubMed: 2235145]. 8. Hesham AA, Heba HA. Thrombocytosis at time of hospitalization is a reliable indicator for severity of CAP patients in ICU. Egypt J Chest Dis Tuberc. 2012;61(3):145-9. doi: 10.1016/j.ejcdt.2012.10.030. 9. Greene C, Lowe G, Taggart C, Gallagher P, McElvaney N, O'Neill S. Tumor necrosis factor-alpha-converting enzyme: its role in community-acquired pneumonia. J Infect Dis. 2002;186(12):1790-6. doi: 10.1086/345799. [PubMed: 12447765]. 10. Klinger MH, Jelkmann W. Role of blood platelets in infection and inflammation. J Interferon Cytokine Res. 2002;22(9):913-22. doi: 10.1089/10799900260286623. [PubMed: 12396713]. 11. Park K. Parks textbook of preventive and social medicine. 22nd ed. Jabalpur (India): Banarsidas Bhanot; 2013. 12. Tiewsoh K, Lodha R, Pandey RM, Broor S, Kalaivani M, Kabra SK. 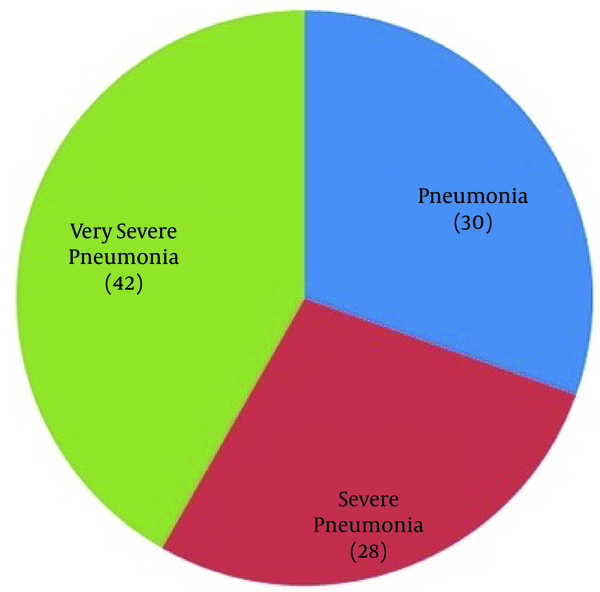 Factors determining the outcome of children hospitalized with severe pneumonia. BMC Pediatr. 2009;9:15. doi: 10.1186/1471-2431-9-15. [PubMed: 19236689]. 13. Usha D, Sudha R. Significance of thrombocytosis in lower respiratory tract infections. Medpulse -Inter Med J. 2014;1(9):470-5. 14. Yohannan MD, Higgy KE, al-Mashhadani SA, Santhosh-Kumar CR. Thrombocytosis. Etiologic analysis of 663 patients. Clin Pediatr (Phila). 1994;33(6):340-3. doi: 10.1177/000992289403300605. [PubMed: 8200167]. 15. Vlacha V, Feketea G. Thrombocytosis in pediatric patients is associated with severe lower respiratory tract inflammation. Arch Med Res. 2006;37(6):755-9. doi: 10.1016/j.arcmed.2006.02.009. [PubMed: 16824936]. 16. Unsal E, Aksaray S, Koksal D, Sipit T. Potential role of interleukin 6 in reactive thrombocytosis and acute phase response in pulmonary tuberculosis. Postgrad Med J. 2005;81(959):604-7. doi: 10.1136/pgmj.2004.030544. [PubMed: 16143693]. 17. Purcell K, Fergie J. Lack of usefulness of an abnormal white blood cell count for predicting a concurrent serious bacterial infection in infants and young children hospitalized with respiratory syncytial virus lower respiratory tract infection. Pediatr Infect Dis J. 2007;26(4):311-5. doi: 10.1097/01.inf.0000258627.23337.00. [PubMed: 17414393]. 18. Mirsaeidi M, Peyrani P, Aliberti S, Filardo G, Bordon J, Blasi F, et al. Thrombocytopenia and thrombocytosis at time of hospitalization predict mortality in patients with community-acquired pneumonia. Chest. 2010;137(2):416-20. doi: 10.1378/chest.09-0998. [PubMed: 19837825]. 19. Sreenivasa B, Kumar GV, Manjunath B. Study of significant of thrombocytosis in lower respiratory tract infection in children. Int J Contemp Pediatr. 2015;2(2):103-7. 20. Prina E, Ferrer M, Ranzani OT, Polverino E, Cilloniz C, Moreno E, et al. Thrombocytosis is a marker of poor outcome in community-acquired pneumonia. Chest. 2013;143(3):767-75. doi: 10.1378/chest.12-1235. [PubMed: 23187959].